For Shawn's birthday, I decided to cook steak for dinner. 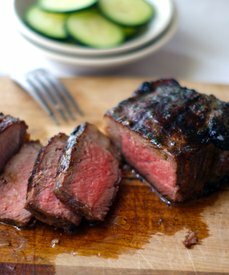 I never really cook steak, mostly because I'm usually too nervous that I'll undercook or overcook it. So on his birthday, I went to Whole Foods and asked the butcher which cut he would recommend to be cooked in a skillet. I expected him to sell me the most expensive cuts, like the $29.99/lb. bacon-wrapped filet or the tenderloin. To my surprise, he said, "Without a doubt, the teres major. It's a shoulder cut that's just as tender as the tenderloin, and it's what all of us butchers buy for ourselves." The price? $7.99/lb. The teres major it was! Let the meat come to room temperature for at least 30 minutes to an hour on the counter (you don't want it to be cold, basically). Preheat the oven to 400°F. Salt and pepper both sides of the meat really well. Over medium heat, sear each side in butter in a skillet for 2 minutes on each side, or until a brown crust forms. Then transfer the entire skillet into the preheated oven for about 5 to 7 minutes or until the internal temperature reaches 140° to 150°F (for medium to medium well). This made for the most tender, juicy steak we've ever had at home - and all for less than $7 for both of us! Amazing! This would be so perfect for having company over during the holidays... they'd think you bought them $40 steaks. bet Shawn enjoyed that! :-) sounds delicious! I officially trust you on all things meat since the roasted chicken & broth sooooooo I'm gonna give this a go! Ok, that's amazing! I have never, no never, cooked a steak. That just might change... :) Thanks! remarkable attributes of the app, which are additionally most Tutu App install and also simple to mount on the device. This is a post about chicken.